Uniformly spreads lawn fertilizer, grass seeds and ice melt. Enclosed gears prevent debris interference. Gate adjustment to adjust the gate to accommodate ice melt to rock salt. Trigger gate control to control the flow of product. Impeller for an even spread of material. Rugged scoop teeth cut through material for easy scooping. Rear baffle keeps seed from filling your pockets. Metal gears. Gate adjustment easily controls how much you apply. Waterproof lining keeps seed dry. Long lasting durable finish powder coated steel frame. U-shaped handle for easy operation. Adjustable gate control for accurate spread settings. Rotary gate with agitator. 9" poly wheels roll easily over any surface. Enclosed acetal gears prevent debris interference. 85 lbs. capacity provides 14,000 sq. ft. Poly hopper & spreader plate are rust proof. 8' to 10' spread width. coverage. 10" x 1.75" pneumatic tires. Setting recommendation for multiple materials included. Now equipped with exclusive SideSpred Control that allows for spread to be shut off on left allowing for precise control. Controls located high on handle for operator convenience. Molded hopper has a 1,500 cubic inch capacity and is totally rustproof. Superior feathered-edge broadcast. 10'' wheels, deep treads with strong reinforcing ribs. Strong tubular steel frame with a black powder coating to guard against rust. Long lasting durable finish powder coated steel frame. U-shaped handle with ambidextrous ball for easy operation with both or either hand. Rotary gate for an even spread pattern. 10" wide tread pneumatic tires provide stability over uneven terrain. Market matched gate settings commonly used manufacturer settings for ease of use. Enclosed acetal gears prevent debris interference. Durable, lightweight and rustproof poly hopper with sturdy steel frame. Rust resistant powder coat finish. Knobby tread pneumatic tires with sleek rims. 80 lb. hopper capacity. Spreads an area up to 12' wide. U-shaped flip up handle simplifies assembly and operation. Adjustable gate settings for accurate spread settings. Wide tread 10" pneumatic tires provide stability over uneven terrain. Adjustable front and side baffles for directional control of spread pattern. Enclosed acetal gears prevent debris interference. Spiked auger for aggressive spike pattern to tear up clumps. Powder coated steel frame for a long lasting durable finish. Grate and rain cover included. Now equipped with exclusive SideSpred Control that allows for spread to be shut off on left allowing for precise control. Designed for use with full size garden tractors. 100 lb. load bearing capacity chassis, commercial gearbox. Rate setting control high on handle for easy adjustment. Large 10" pneumatic wheels. High volume 80lb. hopper. Professional style, easy-set spreader controls for precise application. Extra large hopper to finish projects faster. Enclosed commercial grade gearbox for smooth rolling and easy maintenance. 25,000 sq. ft. coverage. Large pneumatic tires for easy maneuverability. Fast and easy assembly. Convenient handle for easy on/off. Alloy beveled gear for durability. Assembled product size: 48''L x 27.125''W x 33.625''H. 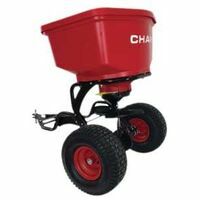 Residential broadcast spreader. 80 lb. capacity hopper. Powder coated steel frame with edge control. 12" fully pneumatic tires and fully adjustable gate with application reference chart. Sure-Spread technology. 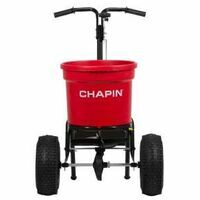 Ideal for spreading fertilizer, salt, ice melt, granular pesticides, weed and feed. Professional style, easy set controls for precise application. Extra-large hopper to finish projects faster. Enclosed commercial grade gearbox for smooth rolling and easy maintenance. 25,000 sq. ft. coverage. Large pneumatic tires for easy maneuverability. Universal hitch fits most lawn tractors, regardless of brands. Fast and easy assembly. Convenient handle for quick on/off. Alloy beveled gear for durability. 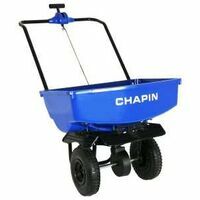 Durable, lightweight and rustproof poly hopper with sturdy steel frame. Adjustable flow rate for optimal material coverage. Knobby tread pneumatic tires with steel rims. Spreads an area up to 12' wide. 125 lb. hopper capacity. 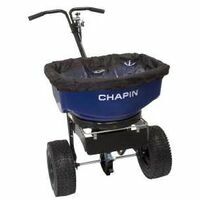 Spreader is designed to spread a range of materials (Fertilizer, Grass Seed and Ice melt). Enclosed metal gears prevent debris interference. Solid steel linkage with gate control opens and closes the gate in incremental steps. Powder coated steel frame provides a long lasting durable finish. Spread pattern control for directional spread pattern control. Heavy-duty 12" wide tread pneumatic tires for professional use. T-handle with rubber grips for heavy-duty professional use. Adjustable rotary gate with cast zinc-plated agitator. Finger grip for balanced lifting. Grate and rain cover included. Now equipped with exclusive SideSpred Control that allows for spread to be shut off on left allowing for precise control. High volume 3,350 cu.in. capacity hopper will hold up to 100 lbs of fertilizer and includes a hopper screen. Rate control setting located high on handle for precise adjustments. Height adjustable handle with 3 positions and cushion grip for hours of comfortable use. Solid direct connect linkage for positive flow control, accurate calibration and low maintenance. Heavy-duty frame has 175 lb. load bearing capacity. Large 13" x 5" pneumatic stud tires on rustproof poly rims. Super-duty gearbox with enclosed gears for years of trouble-free use. Mostly set-up for easy sale. High volume 1,900 cu. in. 80 lb. capacity poly hopper. Easy quick-connect horizontal mount system. Sealed 12 volt motor mounted in the hopper for long life. Fits most ATV's. Powder coated chassis. Mounts to the front or rear luggage rack. Lever and gauge mounts to either side depending on mounting front or rear. Wiring harness with on/off switch included. Spreads seed & feed and fertilizer. Poly hopper with heat-treated steel gear drive. Enclosed Gearbox. 10' to 12' spread width. 175 lb. capacity covers approximately 40,000 sq.ft. ; 15" x 6" pneumatic turf tires with ball bearings.